Every beautiful smile is built on a foundation of good underlying health. At Brookside Dental we provide a broad range of services to help you and your loved ones enjoy healthy smiles for years to come. Schedule a visit to our convenient Indianapolis office today! How Do Cleanings & Preventive Treatments Help My Smile? The most important way to ensure your smile stays healthy is to catch and treat small problems before they become big ones. Regular cleanings allow the dentist to refresh your smile and clean up what brushing and flossing can’t. 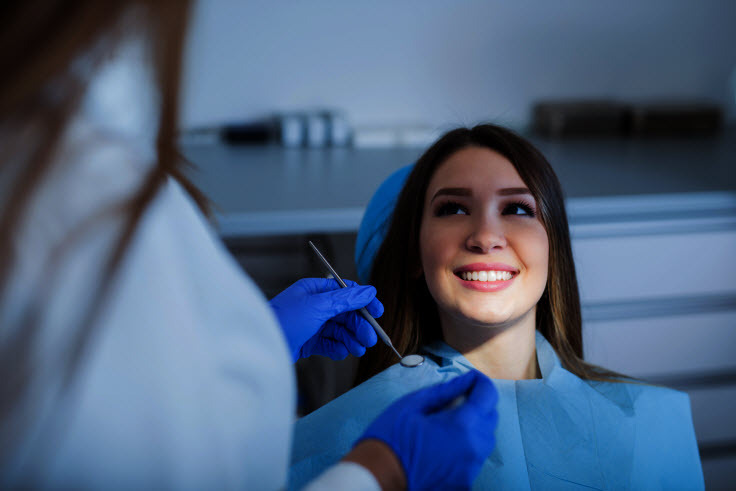 Your bi-annual visits also give the dentist a chance to examine your mouth and look for existing problems or signs that health issues could crop up. What Kind of Treatments are Included? Children are especially at-risk for dental problems because they haven’t yet learned to care for their teeth properly or to limit sugary foods. While a child’s first set of teeth will all be replaced eventually, they play an important role in oral health development. Our caring team will monitor your child’s growth and educate them on how to take care of their teeth. Seniors are more prone to dental problems, especially gum disease, for a variety of reasons. However, regular dental visits can ensure that teeth are well cared for and last as long as possible. Treatments like implants and implant supported dentures can help seniors retain bone mass and maintain facial aesthetics. Patients who’ve been treated for moderate to advanced gum disease may be at risk for relapses, even if their symptoms have been reduced. We recommend more frequent exams and cleanings to maintain optimal oral health. During a dental exam, we take a thorough look at your entire mouth. This includes checking for cavities, signs of gum disease, infection, and other dental health issues. X-rays of your mouth are also taken once a year to let the dentist evaluate your bone and tooth structure below the surface. We use digital x-rays, which uses far less radiation and provides a clear picture of your current oral health. We also include oral cancer screenings as part of your exam. Using special tools, we can identify signs of oral cancer almost anywhere in the mouth – sometimes even when it’s hidden below the skin. As with all types of cancer, the prognosis is better the sooner the cancer is detected. Not Sure What Dental Cleanings Do? Here’s What You Need to Know! Dental cleanings use special tools to brush, scrape, floss, and rinse harmful substances from your whole mouth. Aside from removing food particles, cleanings clear your teeth of hardened plaque – known as tartar – which regular brushing and flossing can’t remove. It’s an important step in protecting your teeth against cavities! Normal cleaning is gentle, designed to clean and freshen your mouth, and shouldn’t cause any pain. If cleaning is painful, it could indicate that some part of your mouth isn’t healthy. Let us know right away if you feel pain, so we can find the source and treat it appropriately. Most patients with good oral health will benefit from cleanings every six months. Depending on your case, however, we may want to see you more often. If you’ve had gum disease, for example, you should visit us every three months to ensure your gums stay healthy. Can Dental Cleanings Help Bad Breath? It depends. Plaque and tartar can contribute to bad breath, but they may not be the only cause. The dentist can help you identify whether your bad breath is from your oral health or another source. Struggling with Bad Breath? These 5 Tips Might Help! How Does Fluoride Help My Smile? Fluoride is a natural mineral that’s frequently added to dental products like toothpaste and mouthwash. It’s also regularly used in dental cleanings. Fluoride mixes with other minerals in your mouth to help strengthen your enamel and prevent tooth decay. In the past, fluoride was used mostly for children, but today we recommend fluoride for smiles of all ages. Sealants are an inexpensive and non-invasive way to add extra cavity protection. A thin coating is painted over the tooth surface, usually on the molars. The sealant forms a tight bond with the enamel and protects your teeth from acid and bacteria. Sealants can last up to several years but should be evaluated during each dental visit. In many cases, the answer is yes! Putting sealants on a healthy tooth greatly lowers the risk of tooth decay. Not only do your teeth stay healthy, but sealants cost much less than fillings or crowns, and are easier to maintain. The only real disqualifier for sealants is if the tooth already has a filling or tooth decay – in those cases, sealants can make it harder to treat decay before it advances. Would sealants be a good choice for my teeth? How do I take care of sealants? One of the most important parts of exams and cleanings is looking for signs of gum disease. Nearly half of all adults have some level of gum disease, but many people dismiss the symptoms or don’t even notice them. The type of treatment depends on how severe the gum disease is. Once gum disease is identified, we will talk you through your treatment options and help you understand your condition better. In the early stage of gum disease, called gingivitis, the symptoms are mild. Your gums may be sensitive to heat and cold and may bleed when you brush or floss. While these symptoms probably won’t disrupt your life, if left untreated, it can lead to more serious problems. Advanced gum disease, called periodontitis, involves an infection of the gum tissue. At this point, bacteria creates infected pockets beneath the gum line. The gum tissue pulls away from the tooth roots and the jaw bone shrinks, loosening teeth. Gum disease is the number one cause of tooth loss. These infections can also travel through the bloodstream, creating secondary infections in other places, including your heart and lungs. Prevention is always ideal when it comes to gum disease. Maintaining good hygiene habits at home and seeing the dentist twice a year goes a long way toward keeping gums healthy. Deep Cleanings: Special tools are used to clean plaque and tartar below the gum line, allowing the gums to heal. This treatment is also called scaling and root planing. Pocket Reduction: Will close pockets of bacteria around tooth roots and promote gum health. Gum Grafts: Restore the natural gum line when the disease has caused the gums to recede. Antibiotics: Can be administered topically to the site of infection or as a course of pills. Enjoy Your Healthiest Smile Yet! If you need a trusted dental team to help you care for your smile, Brookside Dental Care can help! We invite you to explore our site or contact us to schedule a visit to our welcoming office. We look forward to helping you achieve your very best smile!